We are a Printer Slotter Die Cutter manufacturer in India.We have been supplying our wide range of products to all overIndiacustomers. For Better understanding of our customer we have given alternate names of the products also. 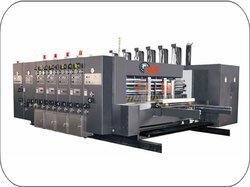 This machine is component with the feeding unit, printing unit, slotting unit, can accomplish the process of the corrugate paperboard printing, slotting and die-cutting. The materials of the body is HT250,thickness of body is 50mm,making by CNC machine, with high strength and high precision. All the transmission gear is spiral gear, materials is 45# steel, after harding treadment, and adopt automatic circle lubrication, with low noise, high precision and long use life. Bearing adopt the famous brand in China like JINLUN,WANGXIANG AND HAERBIN. The electric contactor adopt TELEMECANIQUE brand. The rubber roller adopt Jizhou Chunfeng Yinxing rubber roller, famous brand in Taiwan. Paper-feeding part : Auto chain feeding. Max. 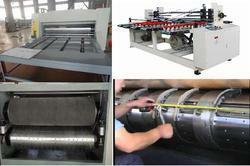 printing speed : 60 sheets/min. 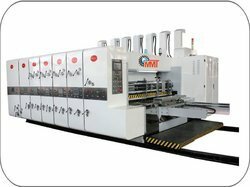 Economy printing speed : 40 sheets/min. Max. paper coverage area : 1400×2400mm. Min. paper coverage area : 380(full block print)×500mm. Effective print area : 1400×2200mm. Adapted paper board : three layers, five layers, seven layers.